Kevin Ehrhart has been a member of the Omaha Theater Company staff since 1988. While at the Theater, he has directed mainstage, studio theater, and national touring productions. Recently, Kevin directed the Bully Show at the Kennedy Center for the Performing Arts' New Visions New Voices program. 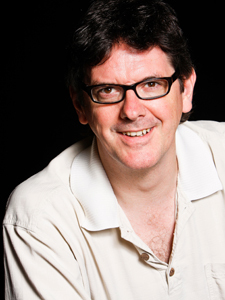 Kevin is also a founding member of the Circle Theatre, where he has directed and acted in many productions. As an educator, Kevin has been involved in teaching students from preschool age through high school. He has developed creative drama curriculum surrounding improvisation, movement, directing, and playwriting. Kevin has also been a member of the Arts Are Basic program in Lincoln, Nebraska from its inception. As a Master Teacher, Kevin has developed two separate arts-in-education courses of study for elementary teachers. As a teaching artist with the program, he has co-taught with teachers at nearly every elementary school in Lincoln. Kevin has also attended teacher training workshops in New York at the Lincoln Center Institute for Esthetic Education.